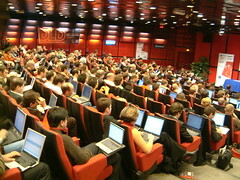 Loic Le Muer informs us that Les Blogs III will be returning to Paris on December 11 and 12. But I genuinely wish SixApart, TechCrunch, NetVibes, Jeff Clavier and everyone else organising the event the best of luck with it. Previous Post Investment opportunity: buy shrink-wrapped Win XP now! Excellent – thanks for flagging, Ben. Think I may well go along.